Below you'll find information about accessing and using the analysis environments for GeoAnalytics Tools in Map Viewer. This information applies to all GeoAnalytics Tools. This topic discusses theGeoAnalytics Tools available through a portal enabled with ArcGIS GeoAnalytics Server. For information about the standard feature analysis tools, see Perform analysis. See Understanding analysis in ArcGIS Enterprise for an overview of each toolset. If you do not have these privileges, you will not see the Perform Analysis option as described below. Open a web map in Map Viewer. You can optionally add layers to the map you're analyzing, or browse for layers when running your tools. You can not add big data file shares to your web map. You must browse for these layers to run analysis on them. Click Analysis on the map menu bar. Alternatively hover over the layer you want to analyze and click the Perform Analysis button . If you have Raster Analysis enabled, click the Feature Analysis tab and click the GeoAnalytics Tools tab if it's available. Tabs only appear if you have both GeoAnalytics Tools and Standard Tools enabled. If you do not have Standard Tools enabled, you will not see a tab. Click the Analysis Environments button . 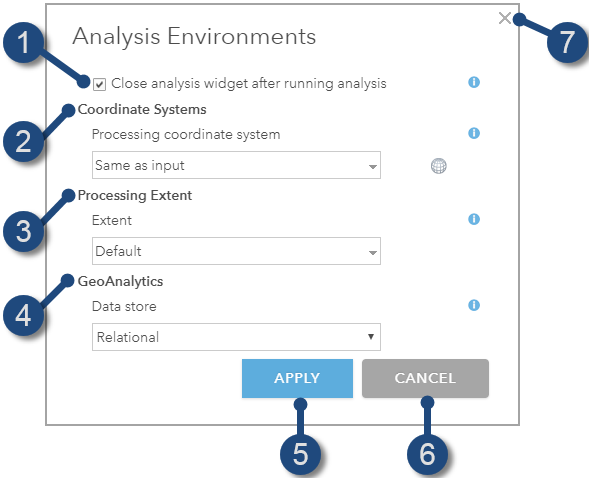 The Analysis Environments dialog box is illustrated below. This example shows the environments that are applied to GeoAnalytics Tools. If you also have Raster Analysis enabled, you need to select Feature Analysis to see this dialog box. Choose to keep the analysis pane open after running analysis. By default, it will close then you run analysis. Set the processing coordinate system. Learn more about the processing coordinate system options below. Set the processing extent. Learn more about the processing extent options below. Set the data store for resulting outputs. Choose between ArcGIS Data Store and big data file shares. Learn more about data store options below. Cancel and close the Analysis Environments dialog box without saving changes. Close the Analysis Environments dialog box without saving changes. The processing coordinate system applies to all GeoAnalytics Tools. The processing coordinate system is the spatial reference used during execution of analysis. The processing coordinate system only applies to GeoAnalytics Tools and must be set each time a tool is run. Results are stored in the spatiotemporal data store using GCS WGS 84. If you copy a layer to the relational data store using the Copy to Data Store tool, the output will be stored in the spatial reference where it was projected. Same as input—The tool uses the input feature's coordinate system for processing. This is the default. Layer < layer name >—The tool uses the coordinate system of a layer included in the map for processing. As specified—The tool uses a coordinate system you specify by either browsing for a coordinate system by clicking the browse coordinate system button or typing in a WKID. When you use the As specified option and browse for a coordinate system or type in a WKID, the Analysis Environments dialog box displays the selected coordinate system using its WKID. When you use the As specified option for the processing spatial reference and extent, you can see what you selected. Default—The tool uses the extent of the data specified by the tool being run. If a tool has Use current map extent checked, only features in the visible extent are used. If Use current map extent is not checked, all features are used. This option is the default. When this option is selected, Use current map extent is checked by default. Layer < layer name >—The tool uses the extent of a layer included in the map for processing. When this option is selected, Use current map extent is unchecked by default. Checking Use current map extent overrides using the selected layer's extent. As specified—The tool uses an extent you provided by typing the coordinates using the Web Mercator projection. When this option is selected, Use current map extent is unchecked by default. Checking Use current map extent overrides using the selected layer's extent. This parameter only applies to GeoAnalytics Tools.The data store option determines which data store your analysis results will be saved to. You can choose between the ArcGIS Data Store or a big data file share with configured templates. Storing results in an ArcGIS Data Store will expose results as feature layers in you portal content. If you use the Copy to Data Store tool, the data store you choose in the tool overrides the data store setting in the Analysis Environments dialog box. Spatiotemporal—The results will be stored in the spatiotemporal big data store. This is the default. Relational—The results will be stored in the relational data store. You should not use a relational data store if you expect your GeoAnalytics Tools results to increase and want to take advantage of the spatiotemporal big data store capability to handle large amounts of data. All features stored in the spatiotemporal data store are stored in the World Geodetic System (WGS84) geographic coordinate system. Alternatively, you can store results in a big data file share. When you store results in a big data file share location you specify the big data file share and the template. When you chose this option, results are stored in that location (a registered file, cloud store, or HDFS), and you'll get a dialog informing you that the tool is running, and again, that your tool has succeeded. The results are not added to your map but are available in your big data file share for further analysis. You must have big data file share templates configured through Server Manager before you can select them as an output option.